This post falls in the first category. In this post, we will learn a tool called Universal Sentence Encoder by Google that allows you to convert any sentence into a vector. Why convert words or sentences into a vector? First, let us examine what a vector is. A vector is simply an array of numbers of a particular dimension. A vector of size 3×1 contain 3 numbers and we can think of it as a point in 3D space. If you have two vectors in this 3D space, you can calculate the distance between the points. In other words, you can say which vectors are close together and which are not. A lot of effort in machine learning research is devoted to converting data into a vector because once you have converted data into a vector, you can use the notion of distances to figure out if two data points are similar to each other or not. For example, if you can build a system which takes as input an image of a person’s face and returns a high dimensional vector such that all the images of the same person’s face cluster together in this high dimensional space, you can easily build a Face Recognition engine. Similarly, if you build a system for converting an image into a vector where images of pedestrians cluster together and anything that is not a pedestrian is far away from this cluster, you can build a pedestrian detector. Histogram of Oriented Gradients does exactly this — it converts an image patch to a vector. Now you can probably see how it would be really cool to represent words and sentences using a vector. You can use a tool like word2vec or GloVe to convert a word into a vector. The amazing thing about it is that if you convert the words “cat”, “animal”, “table” to their corresponding vectors, the words “cat” and “animal” will be located closer than the words “cat” and “table”. Now, going from words to sentences is not immediately obvious. You cannot simply use word2vec naively on each word of the sentence and expect to get meaningful results. So, we need a tool that can convert an entire sentence into a vector. What can we expect from a good sentence encoder? Let’s see by way of an example. Consider the three sentences below. It is obvious that 1 and 2 are semantically the same even though 1 and 3 have more common words. A good sentence encoder will encode the three sentences in such a way that the vectors for 1 and 2 are closer to each other than say 1 and 3. The best sentence encoders available right now are the two Universal Sentence Encoder models by Google. One of them is based on a Transformer architecture and the other one is based on Deep Averaging Network (DAN). They are pre-trained on a large corpus and can be used in a variety of tasks (sentimental analysis, classification and so on). Both models take a word, sentence or a paragraph as input and output a 512-dimensional vector. The transformer model is designed for higher accuracy, but the encoding requires more memory and computational time. The DAN model on the other hand is designed for speed and efficiency, and some accuracy is sacrificed. The table below summarizes the two models. Now, let’s run quickly through the cells and see what’s going on. Next, we import the required modules. If you just want to perform the encoding, you only need tensorflow and tensorflow_hub. We will proceed with DAN here but I would suggest you try out Transformer Architecture as well. Now that we have the URL, we first have to load the model. Next let’s try to embed some words, sentences, and paragraphs using the Encoder. We will take the examples directly from Google’s Colab Notebook. Now comes the Tensorflow part. So we will create a new session and embed the sentences using the encoder. As we discussed earlier, the output will be 512 dimensional vector but to make the output more readable, we are going to print only first 3 elements of the vector for each message. Message: I am a sentence for which I would like to get its embedding. Message: Universal Sentence Encoder embeddings also support short paragraphs. There is no hard limit on how long the paragraph is. Roughly, the longer the more 'diluted' the embedding will be. This is all well and good but what can we do with these numbers? As an example, let’s try to carry out a Semantic Textual Similarity Task. 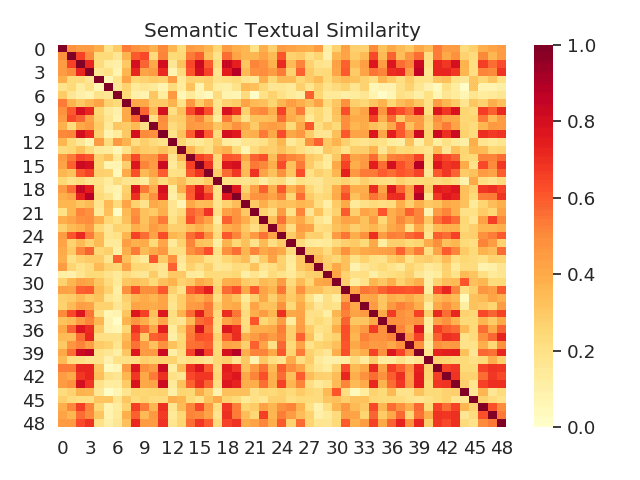 Since the embeddings produced by the models are normalized we can compute the semantic similarity of two sentences using a dot product of the vectors. So here’s what we’re going to do. 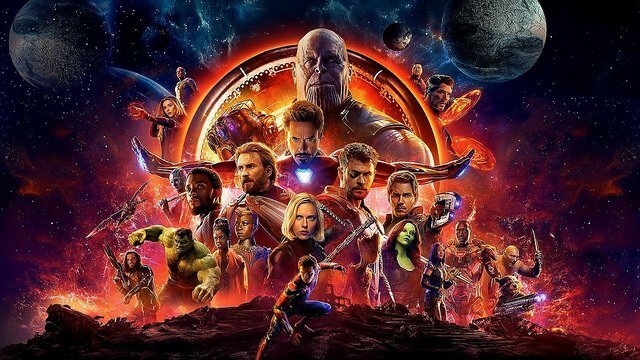 We are going to write a complete set of codes to process the script of Avengers: Infinity War in the memory of Stan Lee (RIP 🙁 ). 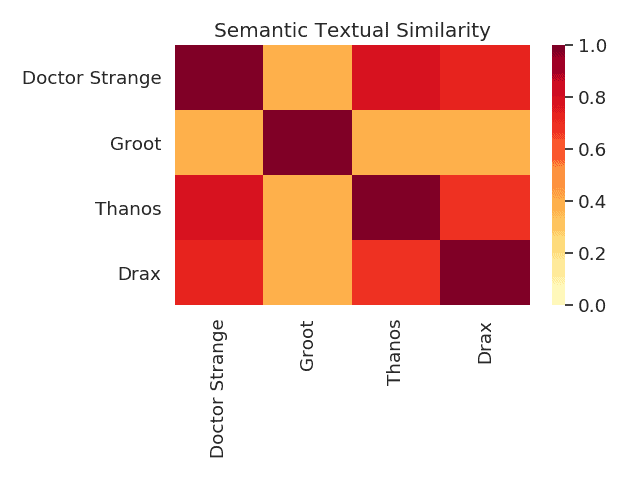 We will extract all the dialogues of characters in the movie and then carry out a semantic similarity analysis on the dialogues to get a similarity matrix. First, we will copy the raw script from Transcripts Wiki and put it in a file – script-raw. Next, we need to remove the content enclosed in brackets as that’s not the dialogue. We will write the rest of the script to a file – script-processed. Once we have the processed script, we have to extract the characters and all of their dialogues in the entire movie and put them in a file. The basic logic we are going to use to get the character’s name is that the format followed throughout in the script is Character: Dialogue. We will also remove any blank dialogues. Finally, we will save the dialogues of a character in a file – character.txt. I told you. I sold it. Why would I lie? Let’s write the function for plotting the similarity plot. First, let’s load some modules and the Encoder. Next, we need to get a list of all text files present in the current directory. This will be the list of dialogues of characters. Now, we will read these files and load the dialogues of a character in a dictionary with a format – character: dialogue. To make things more interactive and easy to use, we will give the user an option to choose the characters to be used for the semantic similarity analysis. Now that we have the messages with us, we go back to tensorflow to run a session, and get the similarity matrix. We will display the similarity in a heat map. The final graph will be a 9×9 matrix (since we have 9 messages in the list) where each element (i,j) is colored based on the similarity. The darker the color, the higher the similarity. Hope you enjoyed the post. Make sure that you try out with some interesting messages and share the results with us in the comment section 🙂 . Is there a PyTorch equivalent of this? You can try with InferSent by FacebookResearch. Which language did both above models support/train? I want to use it for my country language – vietnamese. how to check which language it support? Tf hub provides model for English language, if that’s what you meant. But you can use the other scripts for any language. You can also train your own model if you want. How to use the other scripts for any language. I can’t find information more than you show here. I don’t know what is the both above models in detail? Can you help me? By scripts I meant, the scripts I have provided for processing the raw movie script. As for your problem statement, one easy to implement method would be to first add a section which can translate the input into English language and then use Universal Sentence Encoder. My question is, is there any preprocessing step that needs to be done before encoding the text ? Kindly help me out in this plz. Can you share the complete code along with the text you are using? I made it to work. Initially I was trying embed the data as ‘pandas.core.series.Series’ data type, but when I converted it to a list and tried, it works fine. I’ll find a way to put back the results to the pandas dataframe again. Thanks for the reply again!